We can now be found on facebook. If you "like" our page, you can keep up with updates and owner testimonials ! If you e-mail me and do not hear back within a few hours, please check your spam mail. I have had people tell me that my e-mails are going to spam and I don't know why. Thanks so much ! 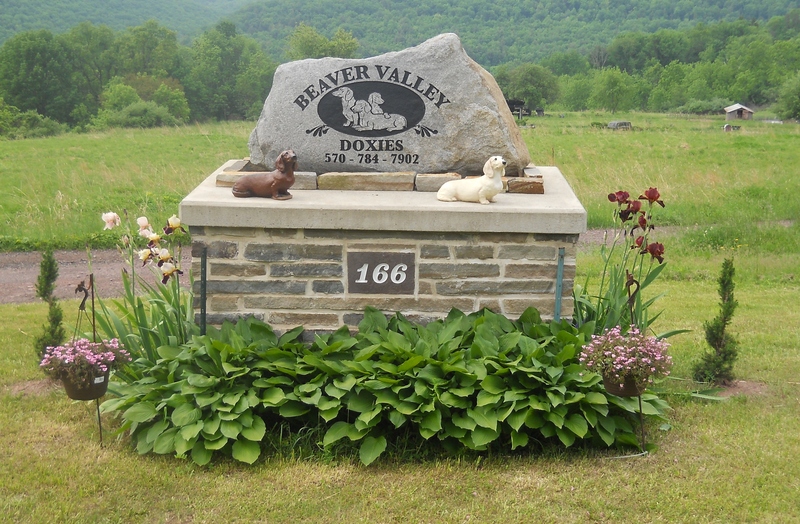 Beaver Valley Doxies is located in Bloomsburg, PA. My name is Lida Bellum and I am the owner and breeder of all of our dogs. Most of our dogs are ACA and/or AKC registered. They are our pets as well as breeding dogs. We love them all and they are well socialized. We have a small kennel for breeding and whelping purposes. 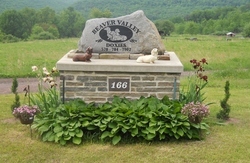 It is licensed and inspected twice a year by the Pennsylvania dog warden and once a year by the AKC. We have been 100% compliant for the past 16 years ! Look for our sign when coming to the kennel ! All puppies are now microchipped and go home with a goodie bag containing Purina Pro Plan Puppy food (chicken and rice shredded blend), Vitamins ( Nuvet), treats and toys that smell like the kennel, Health record form, registration form (if applicable), and their microchip registration form ! All deposits can be made through the deposit page. You do not need a paypal account. Any credit or debit card can be used. Please make sure you ask if the puppy you want is still available before making a deposit. All deposits are NON REFUNDABLE ! Sophie and Chester: Delivered April 17th. Photos will be posted in a week ! Noel and Louie: Due April 17th, possible solids, piebalds and dapples. Could be smoothcoat or longhaired. ACA registered ! Lexi and Oscar: Due April 19th, possible solids and piebalds. Could be smoothcoat or longhaired. ACA registered ! Cierra and Mack: Due mid April, Alapaha Blueblood Bulldogs. ACA registered ! Lorellei and Oscar: Due May 30th, possible solids and dapples. Could be smoothcoat or longhaired. ACA registered ! Dee Dee and Oscar: Due June 5th, possible solids and dapples. Could be smoothcoat or longhaired. ACA registered ! Roxie and Charlie: Due June 10th, possible solids and dapples. Could be smoothcoat, longhaired or silky wirehair. ACA registered ! Lucille and Diesel: Due June 15th, Alapaha Blueblood Bulldogs. ACA registered ! I take a $100 deposit to be placed on my waiting list. You can do that on the deposit page. If you do not receive a puppy from the first litter, then you will move on to the next litter ! Kuranda pet beds are the best ! I use them in the kennel because they are chew proof and last !